The resonance to my recent post on integrating Lean Startup and Design Thinking features to a combined process has been stunning. It really seems to have hit a nerve! What Design Thinking offers to Lean Startup: Many lean startup practitioners have a tendency to treat everything as “pivotable.” This can be dangerous because it turns lean startup into a mechanistic trial and error exercise. The lack of intent makes it easy to get lost. To avoid this fate, it’s helpful to anchor lean techniques around an observed human need, which is supplied by design thinking. You never want to lose sight of the need you’re designing for as you undertake the lean startup. What the Lean Startup offers to Design Thinking: Lean startup methodology helps with discovery of the market opportunity that lives around the observed need. Lean startup’s emphasis on articulating hypotheses and testing them at scale, in the wild, often without users and stakeholders knowing they’re participating in a test, is helpful in this regard. Meanwhile, the rigorous measurement that accompanies lean startups plays a critical role in winning permission from investors and project sponsors to pursue the market opportunities we’re passionate about. This well summarizes again the need for an integrated approach or process, revolving around customers and their needs on the one hand, and properly evaluating a novel market opportunity on the other. One of the central elements of those integrated approaches are prototypes and mockups to gain reliable customer feedback early and throughout the process. In the lean startup terminology the early prototype is called “Minimum Viable Product” (MVP). The term describes the process of narrowing the product/business model scope to core features or hypotheses and start testing it with customers. By gaining customer feedback as early as possible, hypothesis testing and adaptation can be carried out through rapid iterative learning loops. This kind of experimentation is absolutely essential in order to develop and scale new ventures in markets that do not yet exist at the outset. “But the pendulum has swung too far toward building stuff and away from spending some time getting to know your customer first”, says Bill Aulet, managing director of the Martin Trust Center for MIT Entrepreneurship. He warns of falling in love with a prototype that nobody wants to buy. We can’t build great products in the dark, without a well-defined customer and a thorough understanding about their needs and drivers. His advice: Your first question, before HOW and WHAT, has to be FOR WHOM? 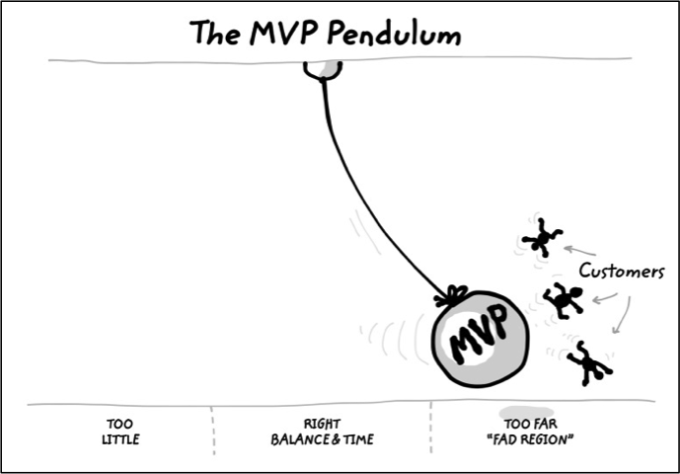 There is another “danger” of the MVP, being outlined by Scott D. Anthony: “Good enough” is a great way to start the innovation journey because it enables learning in the most important laboratory of all – the marketplace. But it’s hard to build a compelling business with something that’s just barely adequate. Customers might be intrigued enough to try it once, but they won’t come back. Eventually, innovation success depends on whether a novel offering creates enough value for customers to pay for it. Think beyond the product to the full offering and business model. Competitive advantage comes from innovative ways of creating, capturing, and delivering value. Success requires fine-tuning more than features and functions. Act on the learning. One of the biggest warning signs for a new venture is a significant gap in product releases. An even bigger warning sign is when there isn’t any plan to introduce an upgraded offering. Minimal viability descends quickly into mediocrity if there isn’t an actionable plan to act on the learning. Finally, from a people perspective, integrating a variety of experiences, backgrounds and personalities is key to innovation success. Both, lean startup and design thinking approaches leverage diverse, interdisciplinary and self-directed teams along their agile and iterative processes. As outlined earlier, we have to value divergence, dissent and complementarity if dealing with lots of unknowns in an innovation project or rapid pace of change in the environment. The innovation process aims at matching problems/needs and solutions. At first, important customer needs or problems need to be identified or anticipated in order to “do the right things”. Later in the process, value proposition, feasibility and economic viability of the solution need to be proven. As suggested earlier, integrating Lean Startup and Design Thinking seems a promising “merger” in order to balance these crucial process ingredients for innovation success.